The head of a black man seen here, enclosed in a shell-like frame and painted in naturalistic colors, represents a key piece of sacred imagery produced by the rich but still imperfectly understood culture of ancient Etruria. This loose confederation of city-states dominated much of the central Italian peninsula for several centuries until its absorption by the Roman Republic by the first century B.C. Though damaged, the terra-cotta plaque still communicates much of its original expressive effect. It was produced through the pressing of damp clay into a mold, a technique ideal for the extensive replication of a single motif across the facade of the temple. Known as an antefix, it once formed the end of a clay roof tile that capped the sloping roof of the sanctuary. These painted reliefs ran along the eaves of the building as a horizontal series of functional ornaments. As one approached the structure, the pitched roof would recede from view, leaving the row of terra-cotta antefixes isolated against the sky. This work comes from an unidentified temple located in the southern zone of Etruscan territory at the present-day Italian town of Cerveteri. To the Romans it was known as Caere, but to the Etruscans themselves it was called Cisra. Situated near the sea, the sizable settlement was an important center of international trade and controlled much of the area around it. The aesthetic experience of an ancient Etruscan temple was quite different from that of Greek sanctuaries such as the Parthenon and numerous kindred examples. The visual effect of the temple, raised on a high base and topped by a massive, overhanging roof, was dominated by a deep porch supported by massive wooden columns. Distinguishing it even further from its Greek counterparts was the wealth of painted terra-cotta sculpture fixed along key points of the exterior. Because of the use of impermanent materials such as wood and mud brick for the structure itself, Etruscan temples survive almost solely as accumulations of this clay decoration. Seen in isolation here, the head of the black man once played an integral role in the spiritual functioning of the structure. Current scholarship has interpreted these heads as boundary figures, separating the mundane world from the sacred precinct of the temple. Not merely decorative, they had an inherent purpose to ward off demonic influences that might disturb the veneration of the deity. That the black head served this purpose is demonstrated not only by the archaeological evidence but also by the representation of black people in contemporary art and literature of the Mediterranean world. At Pyrgi, a port town located not far from where this antefix was found, another temple site has yielded several successive sets of related tile covers. The concept of blackness consistently occurs throughout these groups. For instance, two of the sets of antefixes juxtapose black and white maenads, the female followers of Dionysus, the “good god” of wine and revelry. A subsequent set of these tiles featured black male heads alternating with those of white maenads. The antefix seen here most likely appeared in a similar context of meaning. The use in a religious context of imagery related to the often rambunctious god of intoxication may at first seem incongruous, but it was quite in keeping with the strong sense of complementarity that ruled the ancient world. Although the gods themselves often behaved capriciously, beyond their usually benign presence lay a vast array of destabilizing forces. Antefixes with heads of the followers of Dionysus probably served an apotropaic function—that is, they were placed along the exterior of the temple to ward off any malign influences that might threaten the harmony of the divine precinct. According to the ancient Greek author Plutarch, envious looks were diverted by unusual and often disturbing imagery before they could do any harm. Like the followers of Dionysus, the black man represented a foreign presence in the ancient Mediterranean consciousness and therefore was endowed with the ability to protect the community from harm. 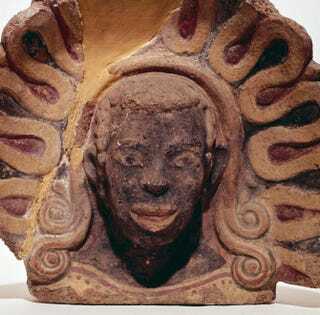 Thus concretized and focused, the black head became a familiar aspect of otherness among the Etruscans. It is worth mentioning that an African form of Dionysus was venerated in Egypt well before the time this antefix was created. In this guise, the god of wine was the son of Ammon, the chief deity of the Egyptian pantheon. The cult of Ammon first arose in the black African kingdom of Meroe, later known as Nubia. A further association is thereby established between the cult of Dionysus and the origins of the black man on the antefix. Though the Etruscans were almost certainly acquainted with actual black people through their far-flung trading network, the motif of the black head seems to have entered their visual vocabulary through a more formal process of artistic transmission. A likely source of the black-head antefix is an unusual group of vases with paired heads created by Athenian potters during this same period. At least two such vases have been excavated at Etruscan sites. These distinctive works have been thoroughly analyzed by the scholar Frank Snowden. Known as janiform vases, these vessels usually feature a carefully modeled black male or female head conjoined with that of a distinctly contrasting type. Frequently, the image of Dionysian satyrs, or “barbarians,” occurs opposite the black face, a combination recalling the alternating types of Etruscan antefixes. It is significant that representations of people of African descent focus solely on the head when they make their first appearance in Mediterranean art. The image of the black was initially imbued with a strongly symbolic meaning, a quality most effectively conveyed by the distinctive features of the head. Interestingly, the same potent strategy would again be employed at a much later, distinctly different phase of European history. At a time during the Middle Ages when the direct awareness of black people was just beginning, the use of the “Moor’s head” as a heraldic device on flags and coats of arms carried with it a similar conception of the black as a signifier of both foreignness and great power.